I meant to post this earlier, making it part of an almost regular Monday publication. Alas, the world is not always what it should be. Still, you get one chapter from my current NaNoWriMo effort, and a picture to boot. Hopefully, it will still count toward Monday. Before I continue, here’s a photo for them who be needing a fix. Question . . . how would you like being that fly? Once more, I present my tracking spreadsheet below. I’m not too far off the schedule, despite six full days without any addition to the word count. The current pattern is to write in the evening, usually between ten and midnight, so I will do some writing right after I post this. Maybe. I’m already late, and I may just blow it off. Here is the update on my novel. For the spreadsheet challenged, the blue line represents the schedule to achieve 50,000 words required to complete the novel during November (it’s a minimum; one is allowed to go over), and the red line represents my progress, where I was before I went to bed last night. Both of those should be read with the axis on the left. The green plot is my daily word count, and it should be read with the axis on the right. As can be seen, as of yesterday, I was 1,696 words behind the straight-line schedule, with a current total word count of 26,643. I still don’t know the overall story, throwing things in on the fly, but, surprisingly, I kind of like it. Maybe not all that surprising; I tend to like what I write. They say one has to like his own writing before even thinking of trying to publish anything. If ‘they’ are right, I’m about 20 years behind schedule. Mind you, it’s probably crap, and I’m being generous adding the “probably” in the statement. Here is a chapter called “Offense is the best defense”. I’ve still not named the novel. The chapter is my attempt of describing a space battle (of sorts). It suffers from using terminology I introduced in prior chapters, but I think the idea comes across. As a reminder, this is as written, no edits. If you see an error, try to figure out what it should be, and assume it will be so in the finished version. Lorea was furious, and tried to take control of the ship as Doryn and Selien struggled to get Brado into the medical unit. “Emergency evacuation override password required.” The ship automated voice interface was not going to comply without the authorization code. Frustrated, Lorea took a moment to control her emotion before asking the next question. “Are we losing them?” Lorea went to the sensors panel as she asked the question. Sensors were not part of the emergency lock-down, and she could see the clear signature of a ship, and it was gaining, despite Riso’s ship being equipped with the latest in Soldion technology. Lorea knew the ship was following protocol in the absence of Riso, and also knew she could not hope to match the ships automated maneuvers. Her main interest in gaining control was to go back to Riso, but that now seemed out of the question. She hoped her little brother knew what he was doing. She turned away from the panel, and helped Doryn and Selien settle Brado into the medical unit. Neither of them were familiar with the unit, but she was. As she cut away the temporary bandages, she addressed Selien. Lorea closed the medical unit, and noticed Doryn’s concerned expression as she looked though the view port at the multitude of tendrils and robotic arms swarming over Brado. “It’s doing what its designed to do. He’s receiving the best care possible.” As she spoke, Lorea rested her hand on Doryn’s shoulder. Doryn nodded, but did not look away from the small observation port. 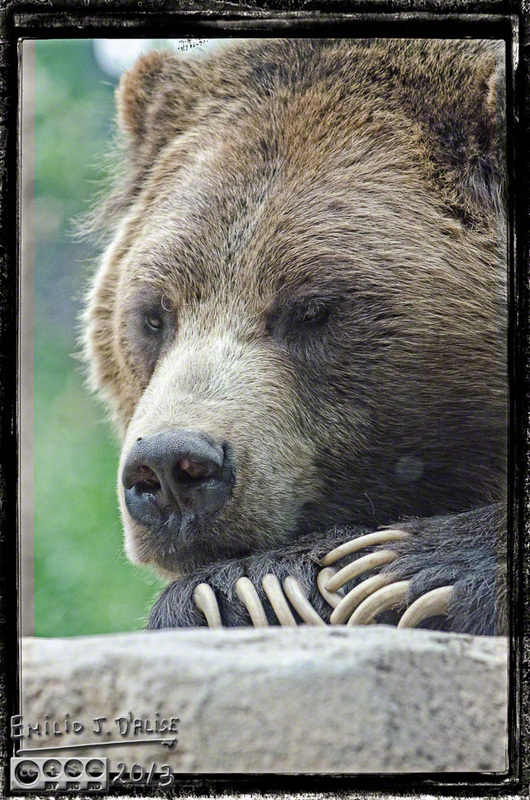 Lorea returned to the sensor. The ship following them had gained substantial ground, and now there was the faint signature of another ship. That ship was even faster. “Too bad this is a defensive ship. It would have been more fitting if it were an attack vessel, you being a General.” Lorea spoke as she watched the approaching vessels. “Shadow.” Riso’s voice came through the communication channel. Before either Lorea or Selien recovered from the shock, the ship’s interior lighting switched to red. Lorea’s shocked expression was replaced by a wide grin. Lorea motioned Selien and Doryn to the side chairs next to the command console. She helped them secure the seven-point harness, and then positioned herself into the command chair. As soon as she was strapped in, the wall in front of the console turned into a tactical screen display with multiple window. Three of the windows showed the relative positions of the three ships in orthogonal views to an arbitrary axis system. One window showed a three-dimension representation of the ships in a volume of space. The rest showed the status of weapons coming on-line. Riso’s ship accelerated nearly perpendicular to the previous sub-orbital trajectory, taking them well above any remaining planetary atmosphere. “Status!” Yelled the order out of frustration. She wanted to engage these ships. “Choosing battle ground above possible damage to surface of planet.” The ship reply came as the other two ships followed. “What is your name?” Selien asked the ship. The screen showed Eternity slowing, then stopping relative to the other two ships. They, in turn, also slowed, but kept their distance. Eternity waited. “Are you going to attack?” Lorea wondered about the capability of this craft. None of the defensive measures were activated. None were even at the ready. One of the screens shrank, making room for a new screen with a much larger view, and with correspondingly larger icons for the three ships. At the bottom of the new screen six more dots appeared. They were moving in their direction. “What does that mean?” Doryn directed her question at Lorea. Before Lorea could answer that she did not know, the ship replied. “What does that mean?” This time it was Lorea asking the question. The ship did not respond. The additional ships arrived, taking up positions enveloping Eternity. Lorea noted their lines of fire did not intersect; each ship had a clear shot at Eternity without worrying about hitting one of the other ships. “Can you magnify one of the ships?” Selien felt strange speaking to her own voice-sake. The ship did not respond, but a side wall cleared, turning into a screen. Centered on it was a ship. The strong side illumination made it almost seem white, but the red was visible where light gave way to shadow. The ship had an insignia of what looked like a bar with a snake poised over it. “Internal Security . . . Sasson has no such ships.” Selien was at a loss to merge her understanding of the new information with the world she had left behind just a few days before. Where did all this come from? How could she had been kept in the dark of what must have been massive ship yards, material and manpower transfers, and all that went along building a space navy? “That emblem above the ‘I’; that is a hand holding a world. It’s the symbol for Modra house.” Lora’s voice carried the anger of someone betrayed by those she deemed friends. “One of the ships is leaving.” Doryn had kept watching the screen, fascinated by both the technology, and by the fact she was in space high above her planet. Lorea noticed the ship leaving was the second one that had came up from the planet. “I’d bet anything that’s Faren’s ship leaving. He knows Eternity is not following protocol,and he’s being prudent. He may not care about the others, but does not want to risk his own life.” Lorea pointed at the screen as she spoke. “Launch detected. Fourteen targets.” As Eternity made the announcement, the interior lighting switched to amber. “Enemy ships repositioned. Second launch detected; fourteen additional targets. Ships employing evasive maneuvers.” Eternity’s running commentary had the three women trying to follow the action on both the three dimensional view, and on the orthogonal views screens. They watched the enemy ships moving in random patterns, but maintaining the envelope around Eternity, which had not moved from her position. The two waves of missiles were getting uncomfortably close, or so it appeared in the screen. “Evade, evade!” Lorea yelled the command, but Eternity did not move. They watched in silence as the dots on the screen got closer. No sooner had Eternity spoken that one of the screens enlarged. One of the red ships suddenly filled the view,, and the women realized this was a live view outside the ship. They could see figures on what looked like the command bridge of the ship. The three-dimensional tactical depiction now showed Eternity’s icon superimposed over that of one of the enemy ships. Splitting her view between the tactical and real-time display, Selien almost missed what happened next. The top of the real-time window brightened, and then a narrow light dropped the height of the screen, disappearing at the bottom. She was not sure what had just happened, but then what she surmised to be condensed air shot out from a thin line spanning the entire red ship, and two halves of the ship separated as if pushed apart. She had barely finished when the view changed again, and another red ship filled the screen. This time the light crossed sideways. Before the results could be seen, a third red ship filled the screen. As Eternity documented the data for later review, the scene outside had slowed to a near stop. Doryn, Selien and Lorea watched the results of the blade of light passing through the ship. They could clearly see the crew still looking to their side, presumably where Eternity had been less than an instant before. The beam had passed right through one of the crew, and the woman did not yet register that she was dead. As they watched in horrible slow motion, puffs of condensed air appeared along the seams of the cut. Just as the ship was about to come apart, Eternity spoke again. The action lasted just a shade longer than it took for the ship to document it. The remaining four ships each appeared for a half a second on the screen before being replaced by another. Following the last one, Eternity entered Slow Time, and then exited to real time, a safe distance away from the battle zone. The now silent women watched in real time as each of the ships disintegrated. There was a sudden bright flash from where Eternity had been, followed by another bright flash a few seconds later. As Eternity spoke, the interior lighting changed to normal, seeming much brighter than before as their eyes adjusted. All three remained seated even as their harnesses automatically released. They were still trying to process what they had just seen, when all three were startled by a snap and a hiss. They turned to see Corporal Brado exiting the medical chamber. His torn skin had been repaired, and sported the rosy color of new skin. It offered an odd contrast to his tanned regular skin. 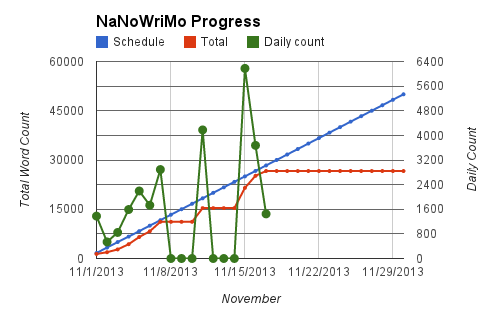 I might or might not have mentioned I’m doing NaNoWriMo . . . I did not sign up at the site (antisocial, I am), but doing it I am. Purposefully, I did not plan the novel, nor even an idea until November 1, around 10pm, when I put down my paint roller (we are repainting a number of rooms) and started writing. I figure I would share the first 1,377 words (the first chapter), but I’m actually at the 4,897 words mark toward my goal of at least 50,000 words. This is as raw as you will see one of my pieces; as written, not edited, nothing rewritten, so if you have the urge to yell out “HA-HA!” and point at something wrong, please hold that thought until I finish the novel. The novel is as yet untitled, but the first chapter title is “Surrender”. Not sure yet about the names; right now I’m just throwing them in there as place-holders. Walking a step behind Doryn, Riso scanned the lines of soldiers lining the path to the surrender table. He saw no hostility, but plenty of curiosity. He noticed the occasional lecherous look aimed at Princess Doryn. He would have liked to wipe the smirks from their faces, but this was neither the time or place. “Please, sit.” Having reached the table, the new Planetary Magistrate motioned for Doryn to take the lone chair on one side of the table. The opposite side had five chairs, all occupied by various officials of the invaders. “You may leave.” The man barely looked at Riso, waving his hand as he spoke. Riso did not move. The Magistrate started to speak, but stopped, finally focusing on Riso. He saw an unassuming figure clad in what in his world would be classified as peasant cloth. A gray shirt, dark gray pants, black moccasins, and a black belt loosely tied at the waist. The eyes held his attention; never before had he seen such pale blue eyes. Almost white, they were no less commanding, giving dimension and structure to the man before him. “I said, you may leave”. This time the Magistrate did not turn away, waiting instead for this unassuming man to heed his order. “I heard you the first time.” The man’s voice was not loud, but deep and rich. “Riso . . .” Princess Doryn looked up at him from her seated position. There was pleading in her eyes; eyes still showing remnants of the tears she had shed for her parents, killed during the taking of the castle two days earlier. “A lot of good it did the Costas having you on their side.” The Magistrate’s words were followed by a smirk accompanied by an amused look in his face. Riso knew immediately when the next thought formed in the Magistrate’s mind. “Don’t.” As Riso spoke the word, his left hand formed a fist, and a staff grew from both sides of it, as if he had been holding it all along. In response, a number of soldiers behind Riso raised their guns. The Magistrate, purely by reflex, asked the obvious question. “Don’t what?” his smirk was replaced by something akin to awe. He had heard the tales of magic, and the tales of advanced technology, but until now had dismissed them as products of the exaggeration of fertile minds. “You have it in mind to test me.” Riso’s other hand closed, and a short blade appeared in it. The blade was hard to focus on, as if made by rippling water. As he spoke, Riso’s four orbs rose from his belt, forming a square around he and the Princess. Once above his head, beams flashed from the orbs, giving him the location of every person in the room. Fifty six; it would be pushing it, but doable. The Magistrate, while in awe of the artifacts and actions of the man, was not about to lose face in front of of his men, and certainly not in front of the Princess, for which he had plans of his own. “You insolent . . . “ He never finished the sentence. The person seated to his left, a soldier by the looks of her uniform, swung her arm, catching the Magistrate in the throat, and knocking him and the chair backwards. She then stood, raising her arm as she did so. “Lower your weapons!” The order, directed at the soldiers behind Riso, caused some confusion in the ranks. “NOW!” She followed up, her voice filling the room. As the soldiers complied, she shifted her attention on Riso. Riso looked at the woman. There was strength there, in addition to intelligence and, he noticed, she carried herself with confidence. After another scan, his staff and blade faded away. The orbs, however, remained hovering above him. The Magistrate was helped up by two guards, and struggled to regain his voice as he once again sat at the table. Rubbing his throat, the Magistrate reached for the surrender documents. A formality, but also ensuring the Costas would cease hostilities across the kingdom, and especially the high seas. The signature of the Princess on these papers guaranteed servitude to the new regime in name only; the people would remain loyal to the Princess, and her agreement to submit to Sasson rule would extend to her subjects. Or at least most of the subjects. The surrender terms were read out load, and as each page was read, the princess affixed her seal to the lower right corner, and the magistrate initialed the lower left corner. An occasional tear fell from the Princess’s cheek, and beaded on the paper before being absorbed, almost like an additional seal. “No.” Riso’s hand covered the Princess’s as she was about to put her seal on the past page. She had not been listening, but Riso had. “She will remain at the palace.” Riso looked at the General as he spoke. The last page contained a provision whereas she would be a permanent guest at the Magistrate’s mansion. Before the Magistrate could object, the general grabbed the ornate pen from the Magistrate, and scratched out that portion of the surrender document, then initialed the change. The magistrate stood, knocking his chair over. “Fine, you finalize it.” Then he turned and marched off, his personal guards trying to keep up. Once he was out of the room, General Rocca turned the last sheet facing the Princess, and she put the final seal on the agreement. The room was quiet as the Princess stood. She did not turn to make her way back out. Instead, she turned toward Riso, and with a sob, hugged him about the waist, burring her face in his chest. Instantly, the four orbs descended, and an opaque shield was formed around them, obscuring them from view of the people in the room. 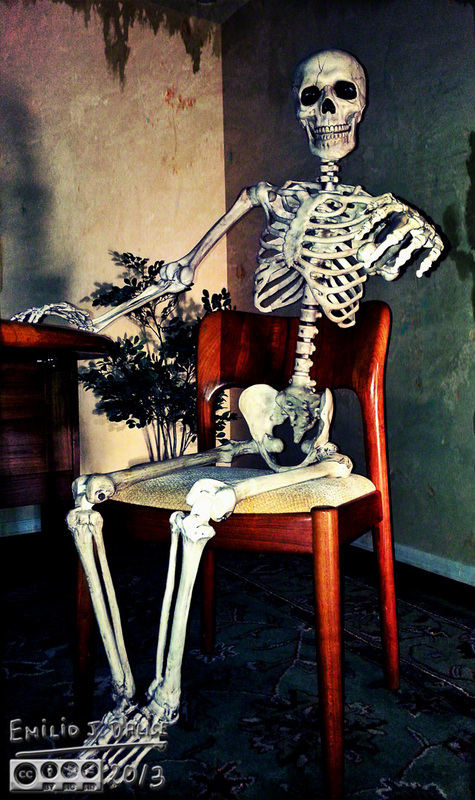 Riso waited for the sobs to slow, then stop. He gently broke the Princess’s hug, and knelt in front of her. Her sixteen years old face was streaked with tear, her eyes red and swollen with yet more tears, and she looked much younger than her years. “Princess Doryn . . . “ Words failed him. Until he crash-landed on this world, he had no idea what children were, and he was not equipped to deal with their emotional immaturity, let alone the grief of having lost one’s parents. “I know,” she said, “I must be strong.” She looked into his eyes, and not for the first time wished she could be as strong, self-assured, and capable as her Riso. “No,” Riso’s voice was soft, as gentle as she had ever heard it. “Now you grieve; there is plenty of time to be strong later.” He wiped a tear from her cheek as he spoke. Doryn looked at him, looked at his clear blue eyes, and threw her arms around his neck. As she held him tight, Riso knew his devotion to this child was not one borne of his oath to the deceased King and Queen. He wondered if this how parents felt toward their children. If so, he thought it was something near magical. It lasted only a minute or so, and then Doryn stepped back, composed and trying to look her station. Riso stood, and the orbs made their way back to his belt, the opaque shield dissolving as they settled into the vacant indents. There were four more orbs spaced around the belt, each a different color; red, blue, green, and white. The returning orbs were all black. The room was now empty, and only General Rocca remained. Happy Hallowe’en to DJ and all visitors.